Directors and cinematographers shoot with purpose, as they match their technical shot choices with the intended tone or emotion of the story. Of course, they’re not the only ones making critical choices. Editors’ decisions hugely determine the success of a film. It is up to the editor to assemble every scene, every cut in a scene, to tell the intended emotional truth of the story. It’s a tall order. 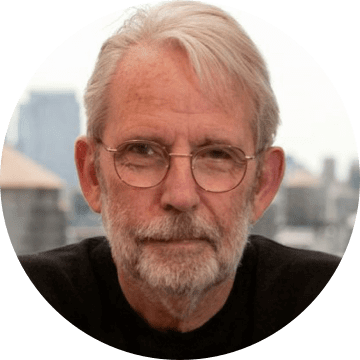 To alleviate some of this pressure, Oscar-winning editor, Walter Murch, outlined some helpful tools. In his book, In the Blink of an Eye, Walter Murch details The Rule of Six, discussing the six categories that make for a great cut. This post explores what these “rules” are, how they’re used in films, and what happens if you break them, (hint: sometimes you should), demonstrating why Walter Murch’s Rule of Six is a great guideline for the beginner or advanced editor. In Walter Murch's, In the Blink of an Eye book, “The Rule of Six” chapter discusses how to create the best cut possible. Murch states that there are six elements needed to make a cut work. He breaks it down in the order of their importance, and I’ve laid them out below. We will zoom in on each one individually. It is important to note that Murch doesn't believe all of these rules can or should be employed at once. He suggests this list as basic criteria for your edits. Let’s begin with his first rule, emotion, accounting for over 50% of what makes a great cut. What does Murch mean by emotion? A good rule of thumb for understanding this is to ask yourself: how will this cut affect the audience emotionally at this moment? Not necessarily that you have to make them feel sad at one cut, or happy at another, this rule has more to do with what the film feels like. Are your cuts working in the right emotional tone or feel for what you are going for overall? Is this transition or cut in line with the general emotional experience of the story? General emotional experience of the story is the vibe or tone you have set. If you want to maintain this tone throughout the story, the cuts and transitions should match that tone. Let’s dive into an example to make this as clear as possible. If we take a look at The Godfather, one of Walter Murch's editing masterpieces, we know our main character, Michael, wants nothing to do with his family's lifestyle. But in the infamous restaurant scene, Michael is faced with a pretty serious obstacle-Sollozzo. The fear of Sollozzo killing Michael's father creates a darker, unpredictable tone for the scene, and consequently, the rest of the film. Let's see how Murch matches his edits with this emotional feel by cutting sound. While this post doesn’t dive too deep into sound editing, it is a vital element when editing with emotional tone in mind. Once Michael is in the bathroom, we see him pull out a hidden gun from above the toilet. 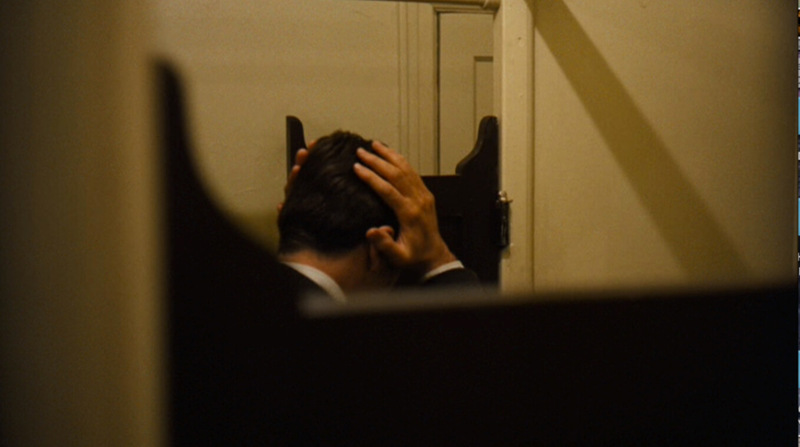 As he goes to leave, he stops, and puts his hands on his head. He is stalling and we can sense his fear. He waits there, with his nerves. And a distant train noise suddenly gets louder. It is cut with clips of McCluskey looking towards the bathroom. One, it builds tension, and we wonder if the two men will come into the bathroom. And two, it makes the audience feel like they’re inside Michael's head. The sound of the train right at that pivotal moment of thought is a great edit to show inner turmoil. We go out and face the music with Michael, unsure of what he will decide. The dark, unpredictable feel of the film welcomes Murch’s choice to cut sound to match the noise in Michael's head. Cutting back and forth from the bathroom to the two men looking towards the bathroom, is also a great way to capture the emotional intensity of the moment. "You have to keep your fingers on that emotional pulse, as an editor. And really...never let it go." Both director, Francis Coppola, and editor, Walter Murch, collaborated well here. Right before Michael shoots the two men, the camera closes in on him, while at the same time, the roar of the train gets louder and louder. Once it reaches it's loudest point, Michael shoots. Murch also chooses to cut the train sound completely once Michael fires his gun. Michael has made his decision. There is no more chatter inside his head. He has sealed his fate as the Godfather. Coppola and Murch's collaboration required serious planning. As you work with other filmmakers on your own projects, you can shot list, storyboard, and share your ideas with your team using StudioBinder's Software. Whichever role you inhabit, pre-planning your shots with shot lists and storyboards is incredibly beneficial once editing begins. Check out how Walter Murch and Francis Coppola worked together to create one of the greatest turning points in film. Walter Murch’s Rule of Six is respected and employed by many filmmakers. Take a look at the video below as Adam Epstein, known for his editing work on Documentary Now!, Saturday Night Live, and The Other Two, gives an entire lecture on the topic. Now that we have a better understanding on Murch’s first rule, let’s explore the second: story. Walter Murch’s second rule-does the edit advance the story? Does the cut, transition, or edit, move the story in a meaningful way? Whatever decisions you make as an editor, do you keep the story in mind? What do I mean by story? Story is what the film is actually about. Try not to confuse plot with story. For example, in Eternal Sunshine of the Spotless Mind, the plot is Joel decides to get his memory erased because his ex-girlfriend had him erased first. But what is the story actually about? If you erase the pain, you erase the love. Every decision in this film drove us to this point. The choice to edit non-linearly serves the story incredibly. Keeping scenes out of order, adds to the confusion of the main character’s loss of memory. But also, for most of the film, we travel with Joel through his memories as they are being erased. We go from his latest memories, to his first moments with Clementine. Because the more painful memories are at the end of the relationship, these get erased first, and by the time we get to the beginning of their relationship, we remember, right along with Joel, the beauty of their love. With that realization, Joel decides he wants to call off the brain procedure. He doesn’t want to erase the love they had. This backwards structure moves the story forward in a deep and meaningful way. It amplifies the emotional experience of the story. A common issue filmmakers, and storytellers alike face, is throwing out what doesn't work. Getting rid of our creations that aren't serving the story can be challenging, even emotional. Once we fall in love with our favorite scenes, or lines of dialogue, it becomes a real challenge to cut them out. This concept of “killing your babies,” or “killing your darlings,” is an issue all creatives face, but it’s potentially the most important one. Initially, the script for Eternal Sunshine of the Spotless Mind, had scenes with Joel’s ex-girlfriend, Naomi. The decision to cut her scenes all together strengthened the theme of the film. The film obviously deals with memories, and remembering our pasts for better or for worse. Naomi only as a memory, keeps her in the past, but also lays the groundwork for his future and the type of woman he craves in Clementine- wild and unpredictable, a complete juxtaposition to “nice” Naomi. Scrapping Naomi’s scenes from the final cut also keeps the focus on Joel and Clementine. The audience isn’t clouded by what could’ve been or have any guilt stricken feelings about Naomi. We only want one thing as the viewer: to see Joel and Clementine get back together. If you have any doubts about your scenes or shots, use StudioBinder’s boneyard feature. The “boneyard” is a place for you to store scenes that aren’t working right now. You can store all of your “babies” for later use if they’re not working in your current project. 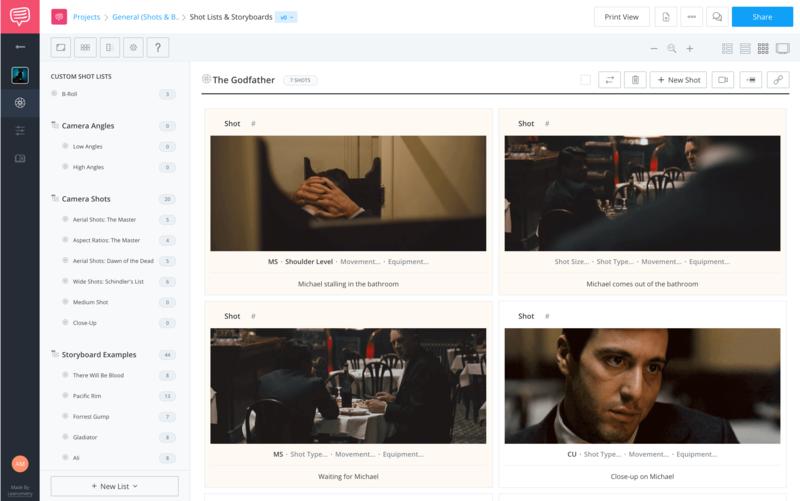 With StudioBinder, you can collaborate with your screenwriter, DP, or editor to discuss which scenes should be resurrected from the boneyard and which ones should be laid to rest. The cuts that pay attention to emotional tone and story are connected by a certain pacing or rhythm that is also in line with this tone and story. Ask yourself, is the cut making rhythmic sense to support the emotion in the story? As an editor, if the idea is to create disorientation or confusion, because the character is confused, or the scene demands it, it is likely the rhythm will be at a frenetic pace. But if the emotion or story you’re telling is more peaceful, the rhythm should reflect that. "I was greatly influenced by musique concrete when I was, like, 10. I was completely mesmerized by the idea that you could make music out of sounds. So that's been a constant influence on all my work." Are the cuts flowing together so the emotional tone is heightened? Did the cut occur at the right place rhythmically? Now let’s take a look at an example – the ending scene in Bonnie and Clyde. Director, Arthur Penn, and editor, Dede Allen, use rhythm well to convey the sudden surprising, yet, inevitable death of the criminals. ​Using motion and jump cuts, the filmmakers accelerates the pace of the two lovers’ fateful deaths. If we take another look at Eternal Sunshine of the Spotless Mind, specifically the scenes where he’s trying to save the memory of Clementine, the rhythm catches up to the fear of losing her. Joel runs with her trying to hide her somewhere deeper-in memories she was never in. The edits are fast and frenetic, mimicking how quickly his memories are being deleted. The rhythm connects the tone and moves the story forward. But to maintain the audience’s attention throughout an entire film, requires something a bit more technical. Let’s dive into Walter Murch’s next Rule of Six. 4. What is eye trace? Before we define anything, let’s go back to basics. Whether you’re an editor, DP, or director, catching and holding the viewer’s attention is always priority. Controlling what your audience sees, and when they see it, demands a strong working relationship from the director and editor. Anticipating where the audience will look next is fundamental to their crafts. So, how do they do this? Eye trace is a filmmaking technique that guides viewers’ eyes to certain areas of the frame through blocking, camera moves, color, lighting, and cuts. The term eye trace is really a tool filmmakers employ to control what the audience sees. Eye-tracing is often used to orient a viewer’s eyes across consecutive edits. "My job as an editor is to gently prod the attention of the audience to look at various parts of the frame. And that - I do that by manipulating how and where I cut and what succession of images I work with." Ask yourself, where is the eye of the audience likely to be looking before I make this cut? And how does this cut affect the movement of the audience's focus? Knowing this ahead of time allows filmmakers to pull off certain “tricks.” Being aware of where their eyes are is a great way to hide information. If their eye is in the center of the frame from the previous shot, and you introduce a new shot with important information in the back corner of the frame, well, you’ve just successfully hidden something from the audience. They're not looking there and could miss it. Fight Club uses the eye trace technique with a slight variation. The audience's eyes are focused on the doctor. The filmmakers know if they want to foreshadow to something, placing a unique prop, or in this case, flashes of Tyler Durden, behind the focus, just might work. If hiding elements aren’t necessary, eye tracing is also used to help the audience follow shifting events in the story. When action speeds along quickly and includes many moving parts, eye tracing through edits enables viewers to keep up. Here’s an example of this film technique at work in Mad Max: Fury Road. There is a lot going on in this film, often, simultaneously. This technique keeps the viewer engaged and on track. The video below provides some great insights into how to shoot a film like Mad Max, ultimately making the edits easier later. If the first shot ends in the center of the frame, you automatically know the eye of the audience will be focused center in the next shot. Use this knowledge to your advantage. Cut to a shot that puts the next important element in the center of the frame. Then of course, as the scene progresses, their eye will wander about the rest of the frame, depending on the other decisions you make. We can also examine how using eye trace through color and positioning heightens emotion in the films we love. Advanced filmmakers know that determining and implementing a unified color palette sets the mood, communicates themes, and charts the story. Color also drives eye-tracing. Watch this scene from Spielberg’s Schindler’s List. Think about how the director’s use of color lands like a gut-punch to generate emotion and draw attention to what Spielberg wants the audience to see. Schindler watches the little girl in red from his high vantage point — and so do the film’s viewers — as chaos unfolds. She stands out against the black and white. The color red functions as a beacon for feeling. He can turn a blind eye to what he’s doing, but he can’t ignore this. We watch him watch, and we feel him feel. Also, the positioning of Schindler, above her, moves the audience’s focus to him, what he’s feeling, and ultimately who he is. His inability to help this little girl creates a kind of helplessness only comparable to the story itself, with eye trace playing a significant role. In order to create such an impactful scene, planning ahead using script breakdowns are helpful. Highlighting what is needed in a scene to lead the viewer’s eye exactly where you want it is of utmost importance. Once you have this, you can organize the shots with StudioBinder’s shot list feature. The director or cinematographer will need this to shoot the best scene, and the editor to create the best cut. Life is three dimensional. This rule is the transposition of our three dimensional world into the two dimensional world we see on the screen. We need to prove, in this two dimensional space, (the flat movie screen), that Person A is actually looking at Person B.
Walter Murch discusses this concept in relation to the 180-Degree Rule. what is The 180-Degree Rule? The 180 Degree Rule is a cinematography guideline that says two characters in a scene should maintain the same left/right relationship to each other. If the camera passes over the invisible axis connecting the two subjects, it is called crossing the line and may confuse the audience. It’s necessary to ask if our shots our crossing the axis that the 180 degree supplies for us. When two characters maintain the same left/right relationship to each other, orientation and screen direction are established. If there is a cut from one character to the next, one character should be looking camera left and the other should be looking camera right to maintain that orientation for the audience. Of course, we can break this rule, but it is important to understand it first. In the video below, we see a few examples of how to use the axis to establish orientation and guide screen direction. Now, let’s look at ways filmmakers break this rule to establish intended confusion or disorientation in the audience. The most notable example is from The Shining. In the scene below, Jack, and the caretaker, Grady, meet in the bathroom. At this point, Jack might be hallucinating and is already becoming more possessed by the hotel. About two and a half minutes into this video, Grady says, “you are the caretaker,” and we have already had a cut that breaks the 180-Degree Rule, establishing a shift in Jack’s identity. This type of cut matches the uneasiness of the scene and the entire film. This rule simply ensures that your audience understands where everything is in the scene. Show them where objects are in relation to each other. For example, when I get out of my car, and I step down-do I land on the ground, or am I already in my house? Did the cut establish my physical space well enough so the audience understands how I just got to where I am now. In the early days of cinema, filmmakers were a little paranoid about this. Back then, less cuts were used and it was common to film the actor actually walking from one place to another. They were worried the audience might not be able to follow the events in the story if it didn't match reality. Of course now, this rule gets broken all of the time. Sometimes breaking this rule supports the tone of the film much more effectively than following it. In Inception, people are literally walking on walls. How does that work? Well, if you’ve seen Inception, you know it follows dreams, and dreams within dreams. So what the characters are capable of in that movie lends itself naturally to breaking this rule. It goes with the tone and story of the entire film. Decisions like these are obviously planned way before they get to the editing room. The director, editor, and even the screenwriter, all work together to make sure a shot like this can happen. Using software to collaborate makes big undertakings like this possible. StudioBinder’s shot listing and storyboard feature can help you stay on the same page with everyone on the project, and also, plan your game changing shots ahead of time. When filmmakers apply techniques like the eye trace, they lead audiences to experience a story in an intended way. This is what filmmaking comes down to: storytellers using the tools of craft to elevate feelings, emotions, and plot points into something greater, something shareable, on screen. The next article examines how the director uses film techniques and basic rules of shot composition to tell his dark, engaging tale.